BOLLING AIR FORCE BASE, Washington, D.C. (March 29, 2007) -- For some Airmen, hitting the gym can be a little intimidating. There' s a lot of equipment there, a lot of technique that needs to be learned, and a lot of dedication and planning needed to make any real progress. Fortunately, there's a way the novice -- or the less organized -- can chart a course to a more fit physique, and it doesn't require charts, detailed workout planning, numbers, or existing mastery of all the equipment in the gym. Jerry Nelms, a fitness specialist at the Bolling Fitness Center, helps Army Chief Warrant Officer 2 Joseph Sacci improve his curl technique. 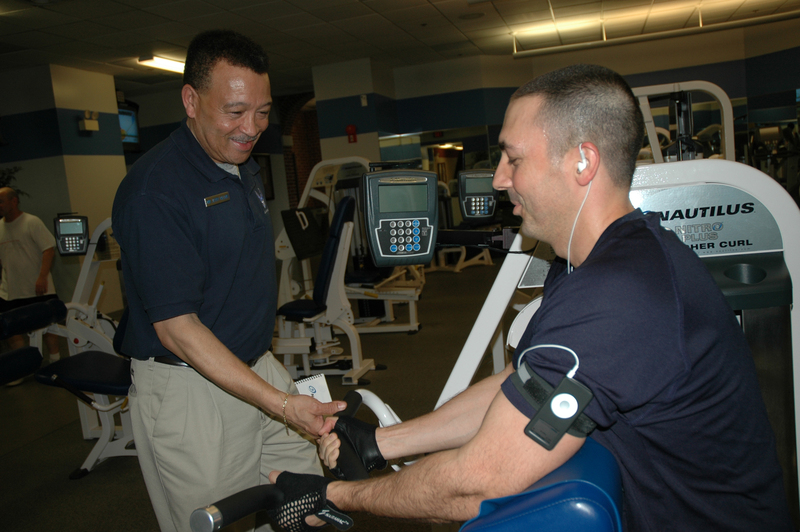 Nelms helps Airmen utilize the Fitness Advisor system. The Bolling Fitness Center has had "The Fitness Advisor" on board for about a year and a half now. The advisor is not a person, but rather some software coupled with sophisticated computer equipment that ties together much of the strength and cardio training equipment at the Center, said Jerry Nelms, a fitness specialist. "Fitness Advisor is a comprehensive exercise prescription and tracking network," he said. "It's a network whereby we track the cardiovascular and the strength training of different individuals." The Fitness Advisor system includes a central computerized kiosk, and radio-controlled computer panels attached to the various pieces of exercise equipment in the Center. Once a part of the Fitness Advisor network, users log in at the kiosk at the front of the gym. There, they receive a pre-planned exercise routine that could include strength training, cardiovascular training, or both. The routine, also called a "prescription" is based on the personal goals users set for themselves when they were first put into the system. As a user moves to each piece of equipment while completing their exercise routine, a control panel there lets them know how much they should be lifting in a particular set, the number of repetitions they should complete and how fast they should lift them. All of this is recorded into a central computer for each user, so the user can focus on exercising -- not keeping the books. As users continue to use the Fitness Advisor system, their exercise routines are upgraded based on their past performance. Nearly every user of the system should move toward success, Nelms said. "If you follow it step by step, you are guaranteed to improve cardiovascular and strength-wise," he said. "You are guaranteed to lose body fat and to tone your body by following the program." Nelms is one of the specialists at the Center that helps input new members into the Fitness Advisor system and also helps them become familiar with all the equipment. He often helps Airmen who have been entered into the Fitness Improvement Program because of substandard scores on the Air Force Fitness test. "The majority of the people that come through, they are a little hesitant because they are in the FIP," he said. "But the majority of them, when they finally see the light is when they go through the program, when we take them through and show them." He says one of the benefits to his job is when an Airmen who has been on the FIP has success with the Fitness Advisor and comes back to tell him about it. "I get a tickle out of somebody coming back and telling me, 'hey, I passed my fitness test,'" he said. "It's intangible, but it's a reward you feel good about all over." The Fitness Advisor is free to use for all Airmen, or anybody allowed to use the Bolling Fitness Center. Users must be 12 years or older to enroll.